How Do I Help a Child Grieve? Dr. Donna Schuurman is the Executive Director of The Dougy Center for Grieving Children & Families in Portland, Oregon, and an internationally recognized authority on grief and bereaved children, teens, and families. She is a gifted speaker, sharing not only her professional stories of working around the world with children after unimaginable losses, but her personal stories as well. I want to focus on one of the most important topics that she discussed, the “Needs of Grieving Children.” As she speaks I find myself questioning whether my interventions with my child were right after the death of his father. Grieving children need good modeling – if you are crying, tell them why, say you are sad without trying to cover up your emotions. Children are wise, they sense when you are covering things up. I know that my son Matt, even though he is only 26 months old when his father dies, is watching my every move and his mood often mirrors mine. I couldn’t fake being fine, so I would use the words, SAD, MAD and GLAD, knowing that he understands those. Saying things like – “I am crying and sad because I miss your dad. I am MAD that he will not be coming home. I am GLAD that we are together. Children need to have the opportunity to share with others and to be understood – this is why bereavement camps and support groups geared toward them are so helpful. Realizing that they are not the only one with this experience is very important to a child. When I remarry a man whose first wife dies when their little girl is 22 months old, our children become their own support group to one another. We speak openly about their father and mother so they know that it can happen to other people, too! It is important for them to find forms of expression, ways to get their grief out. This may be a physical activity, or through the arts. As Dr. Schuurman reminds us, “Play is the child’s work.” Believing my son needs to express his anger, but unable to verbalize it due to his young age, I buy him a clown-faced blow up punching bag. After hitting it once he doesn’t seem interested, but I punch a hole in it after he goes to bed! Getting anger out is important for children and adults! Children need to be included and given choices. If asking them whether they want to attend the funeral for example, you need to give them details about what they will see and hear, who will be there and the plan for them to leave if they decide to. Knowing it would be hard for both my son and me to be separated from one another, he comes to the funeral with me for the family visitation and for a short time after that. When it gets close to bedtime, our neighbor takes him home, continuing his nighttime ritual. Grieving children need a sense of security. Their world has changed and they want to know: what happens now? I didn’t want to leave my son and he didn’t want me to go, but at times there are no options. I tell him where I am going, when I will be home and who will be taking care of him. The other thing I tell him over and over is that he has many people who love him and there will ALWAYS be someone to take care of him. Children need to have a sense of control – they need to be given permission to express their grief or not. Supporting them in their silence may be challenging but it is just as important. They need to decide when and if they want to talk. Consistency and discipline should remain in place and can actually be helpful to grieving children. I can keep up the same caregiver for my son when I go back to work after my husband’s death. Tensions run high after a loss, and like most children, my son reacts to that stress with temper tantrums and bad behavior. I find myself breathing deeply and having to put many things on hold as I comfort him, read to him and rock him – which in turn helps me! Last but not least, Dr. Schuurman tells us about the importance of memorialization and connection for children who are grieving. For older children or those who have been in a support group setting a number of rituals are used. Working as a volunteer at their parents’ favorite organization may be helpful for older children, or learning something new by trying their parents’ favorite hobby. My husband had an ornament collection from his childhood and every year, we still include some of those ornaments on our tree. We have pictures of our first spouses on our wall and continue the connection to this day by talking about them. Looking back, I am proud of the way I was able to help my son intuitively. I am grateful for people like Dr. Schuurman who have chosen the field of bereavement so that resources are available to children and their families grieving the loss of a significant person in their life. Your local children’s hospital, if one is in your area. Your local funeral home to ask for resources for children. Individual states have grief networks that you can find by searching online. 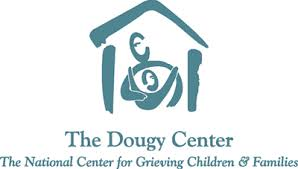 The Dougy Center is a national center for grieving children and their families and offers a large variety of resources. GriefNet an online resource has an extensive list of books under the heading: Resources – Books – Children and Grief. The Center for Loss and Life Transition has a number of resources and books available to help grieving children. What’s your grief a website full of resources, has a wonderful article entitled, Childhood Grief: The Influence of Age On Understanding. What ways have you helped a child who is grieving? What resources have you found helpful? Please share. This entry was posted in Bereavement, Childhood, death, Education, funerals, Grief, grieving, Helping a grieving child, My story, Parenting, parents, Resources, What do the experts say? and tagged bereavement, books, childhood loss, communication, Dr. Donna Schuurman, grief, grief education, GriefNet, grieving, helping a grieving child, Milwaukee, resources, The Dougy Center, websites, What's your Grief? Center for Loss & Life Transition, Wisconsin. Bookmark the permalink. 4 Responses to How Do I Help a Child Grieve? At first Darcy was closed off emotionally. She wouldn’t talk aboit her brother, it made her too sad. She had started having awful night terrors again and began acting out and throwing tantrums. She didn’t know how to deal with her grief. Some 10 months later she and I are scrapbooking a ‘Benny Book.’ She sleeps with her ‘Benny Dog’ and we will start going through his room so that she can take some of his toys. She’s invited his memories back into her life. I’m so proud of my doodle bug! Thanks for a very helpful post. It sounds like your instincts have been guiding you very well. A very close relative of mine found herself trying to cope with 3 young children after a very tragic sudden death and a love of music was what emerged from the grief. It is about 15 years on now and the children have all developed an abiding passion and great proficiency in music; something that seemed to be very therapeutic and in keeping with the interests of the loved one who died. I still listen in awe. That is so lovely and so necessary to find an avenue that soothes your soul. What a gift to be able to listen to their music, I am sure it is deep with emotion? Is it available to the public? Yes, it is an absolute gift. They play with orchestras around the world and also lash into some Irish music when here at home. I don’t have any actual recordings but I’m sure they’ll happen before too long.